Die Zeit (German pronunciation: [diː ˈtsaɪt], literally "The Time") is a German national weekly newspaper published in Hamburg in north west Germany. The first edition of Die Zeit was first published in Hamburg on 21 February 1946. The founding publishers were Gerd Bucerius, Lovis H. Lorenz, Richard Tüngel and Ewald Schmidt di Simoni. Another important founder was Marion Gräfin Dönhoff, who joined as an editor in 1946. She became publisher of Die Zeit from 1972 until her death in 2002, together from 1983 onwards with former German chancellor Helmut Schmidt, later joined by Josef Joffe and former German federal secretary of culture Michael Naumann. The publishing house, Zeitverlag Gerd Bucerius in Hamburg, is owned by the Georg von Holtzbrinck Publishing Group and Dieter von Holtzbrinck Media. The paper is published weekly on Thursdays. The paper is considered to be highbrow. Its political direction is centrist and liberal, but has oscillated a number of times between slightly left-leaning and slightly right-leaning. 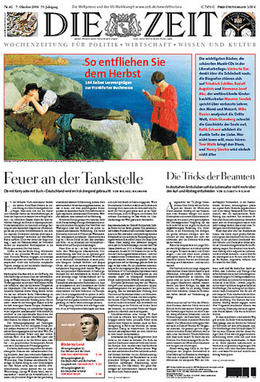 Die Zeit often publishes dossiers, essays, third-party articles and excerpts of lectures of different authors emphasising their points of view on a single aspect or topic in one or in consecutive issues. It is known for its very large physical paper format (Nordisch) and its long and detailed articles. The 1993 circulation of Die Zeit was 500,000 copies. With a circulation of 504,072 for the second half of 2012 and an estimated readership of slightly above 2 million, it is the most widely read German weekly newspaper. It reached 520,000 copies in the first quarter of 2013. The fact that the newspaper bears the coat of arms of Bremen in its title stems from an accident of history: when the paper was founded in the rather chaotic post-war occupied Germany, the city of Hamburg refused the use of its coat of arms in a private publication at the last moment; so instead the space reserved for it on the printing plate was filled with that of the nearby city of Bremen, as one of the founders was a friend of the mayor of Bremen. ↑ Michael Kohler (May 2012). „Die Zeit“ – Erfolg mit Qualität. Retrieved 2015-09-13. ↑ "Marion Gräfin Dönhoff – Obituaries, News". The Independent. 12 March 2002. Retrieved 30 October 2010. ↑ "The yin and yang of human rights in China". The Japan Times Online. 5 September 2010. ↑ Catherine C. Fraser; Dierk O. Hoffmann (1 January 2006). Pop Culture Germany! : Media, Arts, and Lifestyle. ABC-CLIO. p. 200. ISBN 978-1-85109-733-3. Retrieved 1 November 2014. 1 2 Sigurd Hess (2009). "German Intelligence Organizations and the Media". Journal of Intelligence History. 9 (1-2). doi:10.1080/16161262.2009.10555166. ↑ Milton Hollstein (March 1982). "Springer-Germany's Most Remorselessly Criticized Publishing Giant" (PDF). Journalism & Mass Communication Quarterly. 59 (1). Retrieved 7 April 2015. ↑ "Divided on unification". The Economist. 4 October 2010. Retrieved 3 February 2015. ↑ Peter Humphreys (1996). Mass Media and Media Policy in Western Europe. Manchester University Press. p. 82. Retrieved 29 October 2014. ↑ "The Die Zeit Universe" (PDF). ZEITmagazin. 1 January 2013. Retrieved 5 October 2013. ↑ Eric Pfanner (29 April 2013). "As One German Weekly Falters, Another Celebrates Big Gains". The New York Times. Serraval. Retrieved 1 November 2014. Wikimedia Commons has media related to Die Zeit.